The KOFLOC toggle valve is a shutoff valve developed for quick, reliable opening/closing operation. The special structure with a valve section and special O-ring excels in durability, while ultra-cleanliness assures high-sensitivity analysis. 1.Lifting by 90 degrees and tilting for quick opening/closing. 2.Precision machining ensures high air-tightness. 3.The dead space has been minimized. 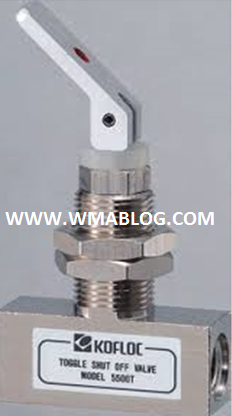 4.The valve can be used for both gas and liquid. 5.This panel-mount type for easy mounting on a panel is compact and ideal for instrumentation. 3.Instrumentation panel boards and various testing devices.